I reviewed this book for TLC Book Tours. 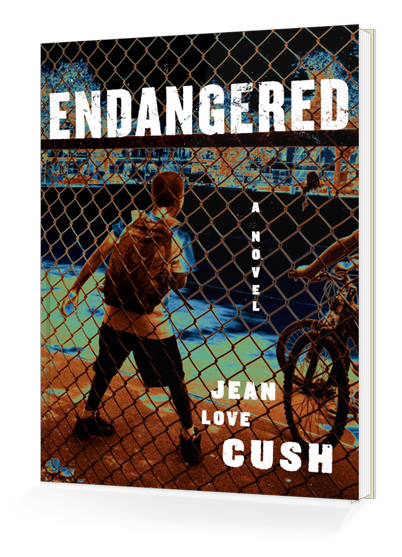 In this debut novel, Jean Love Cush draws from her experience working as an attorney in the DA’s office in Philadelphia as well as in family law dealing with poverty and domestic abuse issues to paint a picture of gross inequality that very much exists in the real world. The statistics surrounding the criminalization of black boys, and how it’s driven by poverty and prejudice is shocking. That the leading cause of death for black males in America is murder, and that black male youths charged with murder are more likely to be tried as adults, severely diminishing their chances of ever being rehabilitated is alarming, to say the least. Endangered opens with fifteen-year old Malik Williams hanging out with a small group of friends on a Philadelphia street corner. Suddenly the sound of police sirens approaches, and when the boys realize that their little gathering is the police’s target, they scatter – all but Malik, who has been told since he could remember by his mother that the best way to stay out of trouble is to cooperate. Before Malik even understands what has happened, he is assaulted by police, handcuffed, thrown in the back of a cruiser, taken to jail, and accused of the murder of another black boy. Janae became pregnant with Malik when she was only fifteen herself. Malik’s father has never been in the picture, and Janae has managed to eke out a life for herself and her son, meeting their basic needs but not much more. A young, single mother who works as a cafeteria cashier, Janae is devoted to her son, and when she is notified that Malik has been arrested, it’s the realization of her worst nightmare. Every black urban mother is all too aware of the fate of too many black boys in the criminal justice system. With no money to hire a private attorney to defend her son, Janae resigns herself brokenheartedly to trusting the public defender assigned to Malik to serve his best interests. Enter Roger Whitford, an experienced and well-respected white attorney. Whitford has devoted his career to working for human rights issues, and he wants to take on Malik’s case at no charge. Whitford, well aware of the statistics surrounding black youths in the criminal justice system, decides to use the Endangered Species Act as the foundation to defend Malik, and to confront the prejudices and inequities against black boys head on in order to change the workings of the criminal justice system in its dealings with black youths. There is also the matter of Malik being innocent of the murder of which he is accused. Endangered is well-written and engaging, and brings to light an important social issue. It’s so easy as a white, middle-class American to understand the plight of the oppressed in abstract terms; I felt that Cush’s novel brought some of it into the harsh light of day. The only thing I didn’t like about the book was the romance angle; Whitford hires a crack attorney to help him with his cause and Malik’s case, and of course he’s very handsome, and of course Janae is beautiful, and of course the two of them fall for each other, and of course it’s a handsome man who will be Janae’s salvation . . . eh. I felt like that angle was just gratuitous and unnecessary. Why couldn’t they be average and not hot for each other? It almost felt like Cush didn’t trust her readers to appreciate the story on its own merits, and that she threw the romance thing in as insurance or something. Or maybe I’m just cynical. In any case, I did appreciate both the writing and the story. Good book! You can find out more about this author at jeanlovecush.com. Thanks for your thoughtful review of this book for the tour!